Another level of security is surveillance cameras. 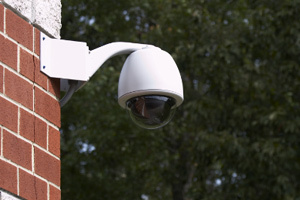 Strategically located cameras can monitor the activity in and around your home or business. TechLife Media Systems specializes in the design and installation of high definition camera systems and monitoring. Integrating surveillance cameras with an automation system provides a higher level of security and convenience. Imagine when your door bell rings, the music in your home is turned down, the touchscreen in the wall and your home TV switches to the front door camera to see who’s there. Our surveillance camera systems can also provide you with the capability to check on your home no matter where in the world you are. Easy to use mobile phone/tablet applications make it possible to check out the activity and also review any recorded activity. We can also send you an email to notify you if the cameras detected motion in your backyard. Contact TechLife Media Systems to find out more.